A delightful addition to my new collection. Such a pleasure to use. In a world where quality of service is almost universally poor and change just means things get worse, Falk stands out like a beacon. 292 customers found this review helpful. Did you? Yes, I did! This lid is well-made, fits the associated saucepan perfectly, is robust, but, like the saucepan, gets too hot to handle without oven gloves or similar. 472 customers found this review helpful. Did you? Yes, I did! Not really necessary but a lovely little luxury to go with your pans. Great seal means that you can get (and keep) things at the right temperature with very little wastage of energy. 556 customers found this review helpful. Did you? Yes, I did! Perfect for a 16cm pan! Beautiful brushed finish as same as cookware! It is a quality and durable lid! 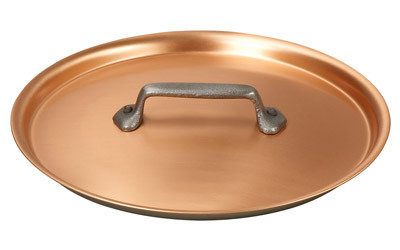 The 16cm copper lid looks fantastic and make the accompanying saucepan/spherical pan look the part. Not thick and heavy, but nice and light, so perfectly practical. Purchased to go with the 16cm saucepan. Fits perfectly and can't be accidentally knocked off the pan while cooking. Bought a range of Falk saucepans and lids and have been delighted with the performance. Beautiful, easy to clean. Perfect. 542 customers found this review helpful. Did you? Yes, I did! My little saucepan requires a perfect lid and this does it.